Eternity Church Croydon is a vibrant, growing Christian Church based in the heart of Croydon, representing some 25 different nationalities from around the world. 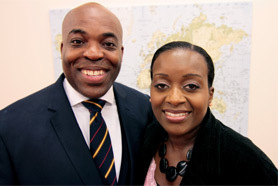 Our church, based in Croydon, South London, was birthed when Pastor Clement and Tracy-Anne Okusi came in 2001 with a vision to see the lost come to the knowledge of Christ. As a result of them obeying the call of God [Mark 16:15 And he said unto them, Go ye into all the world, and preach the gospel to every creature], this revival has broken out in our area, and we saw a steady growth in attendance over the years. Our desire and aim is to see men and women fulfill God’s calling for their lives in the various ministries that are available for Christian believers according to God’s word and personal calling [Romans 12:5 So we, being many, are one body in Christ, and every one members one of another]. This includes taking the Gospel outside the four walls of our church, touching neighbouring cities, and nations beyond. We strongly believe in the pattern that was laid out to the early believers, of reaching people, raising disciples and releasing ministry. The various discipleship programs, bible study groups and outreach ministries- all have the purpose of building up and strengthening the body of Christ, presenting the church as an unblemished bride, for the coming of our Lord Jesus Christ. The Croydon Church is affiliated with the Evangelical Alliance, Assemblies of God UK & Croydon Churches Forum.